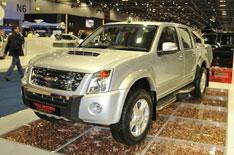 Isuzu's new pick-ups | What Car? Only a short while ago, owning a pick-up was becoming popular among motorists who wanted to stand out from the crowd, and a new genre of car was born: the lifestyle pick-up. Now, even with fuel prices climbing and the environmental consciousness of motorists growing, Isuzu has launched a new special-edition Rodeo at the show, called the LE Sport. It has an upgraded CD player and rear-seat DVD player, and a 10GB music storage device. It is powered by a 161bhp 3.0-litre turbodiesel engine. Also on display are a Rodeo powered by a new 161bhp 3.0-litre diesel engine and a single-cab version of the pick-up, both of which have just gone on sale.